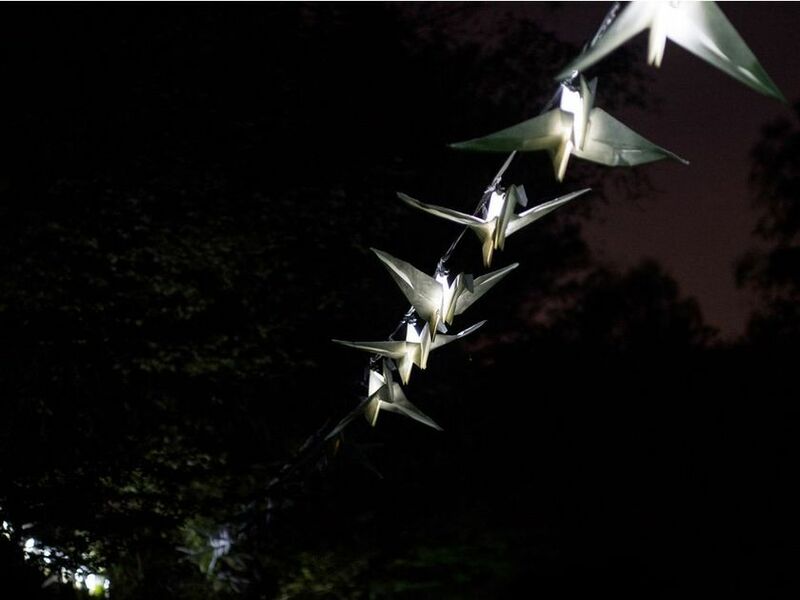 Luminous Birds by Kathy Hinde is in Alexandra Park from Saturday, Dec. 2 to Friday, Jan. 5, 2018 for Lumière Vancouver. Photo: Kathy Hinde. Vancouver’s winter light festival is linking with the world of art to make the annual event more visually engaging to the public. Now in its fourth year, Lumière Vancouver takes place around English Bay and the West End. It officially starts Saturday, Dec. 2. Major light works stay in place until Friday, Jan. 5. 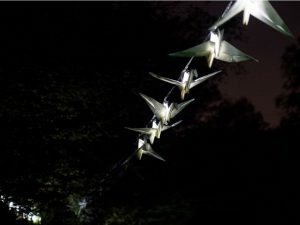 One of the unique works appearing for the first time will use a sequences of lights in origami birds to create the impression of a flock of flying birds. Luminous Birds by Kathy Hinde is being installed around Burnaby and Bidwell in Alexandra Park, the triangle-shaped park with the band shell along Beach Avenue. Lumière Vancouver has improved the quality of its installations by hiring Wil Aballe as curator. “Luminous Birds is the most ambitious work, even though it’s quiet and subtle, but I think quite beautiful,” Aballe said. Hinde is based in Bristol in the United Kingdom. The origami birds are made out of Tyvek, a water- and rip-proof paper. They’re attached to several strands of steel cables connected to trees in the park. The birds have different wing positions so when the LED lights inside each bird turns on in sequence, they look like they’re flying in stop-motion animation. Doppler-like micro music compositions add to the sense of movement. In previous installations of the work in the UK, members of the public have described Luminous Birds as “magical,” “marvellous,” and “tranquil.” They also have said that the soundscape fits in with the neighbourhood’s ambient sound. Luminous Birds works best where there isn’t illumination from nearby sources such as street lights. That’s why it’s in the darkest part of the park in the northeast corner. The birds will be flying at a height of about four metres from the ground. “The installation works best as close to viewer’s heads as possible,” Aballe said.